Two weeks is not long enough to see and do and Be The annual walk around Lake Killarny was energizing and gorgeous once again. The lily pads bloom in the summer and create a colorful palette on the lake. The walk around Killarny is only 4 Kilometers. 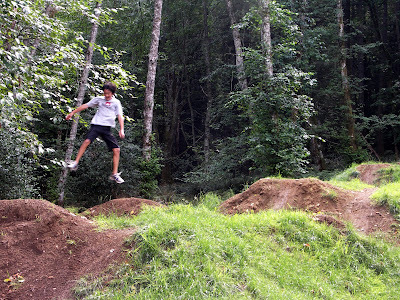 Just across the street from the Killarny Park is the Bowen Island Bike Park. This course is perfect for those that dare ride the narrow planks of pain .......perfect for thrill seakers. Akira and Dana chose to run the obstacle course instead. We always visit Alderbrook Farm for organic and fresh ground meats. Their pet chickens lay all their free range eggs. During the weekend they have an outdoor BBQ serving fresh ground chicken burgers, Lamb burgers, and beef...all organic and delicious. The farm's gardens are idyllic too. Photo taken by Akira. Tuesday night was soccer night at the Bowen Island School. If you can play soccer you can join in on the game. Even though Akira was the youngest he gave the men a challenge. What I love is how the players share the field with the deer....or is it the other way around?